Damn Good Pepper: Intensely Delicious! Just FYI our site works better with scripts turned on. Finally, the perfect balance of flavor and heat. Click here to get some of our amazing pepper blends! We create delicious blends of exquisite peppers from around the world. To ensure quality and consistency, our pepper blends are made in small batches and each bottle is carefully hand-packed. Please take note that while the flavors are amazing and intense, our pepper blends contain some of the world's hottest peppers, including the habanero pepper, the Bhut Jolokia aka ghost pepper, and the Trinidad scorpion pepper, so please be very careful when handling and use sparingly. Always remember that the heat and flavor builds up as the pepper sits in your food or drink so keep that in mind before adding more. Whether you prefer the Original or Special Blend make sure you don't leave home without it. Due to the overwhelming demand, we are currently out of stock! FOR A LIMITED TIME: FREE SHIPPING IN THE U.S.! Our Original Blend is comprised of carefully chosen, mouth-watering peppers. This blend is for a diverse range of palates. Whether you are a beginner or a spicy food enthusiast the Original Blend will get your taste buds going. We put a lot of care into finding a delicious balance of peppers with citrusy, sweet, and tangy flavors. These peppers are then blended with a balanced amount of some of the hottest peppers in the world. For beginners, just add a dash of our product to your food. The complexity of each pepper will intensify the flavor in your meal. If you like your food very spicy, then simply shake on a more liberal amount. You can also order it on eBay if you have issues ordering from our Square store or if you're ordering from outside the U.S. Please visit our amazon webstore only if our stores above do not work (NO FREE SHIPPING). Our Original Blend is comprised of a citrusy, sweet, and tangy blend of peppers mixed with the perfect balance of some of the hottest peppers in the world. 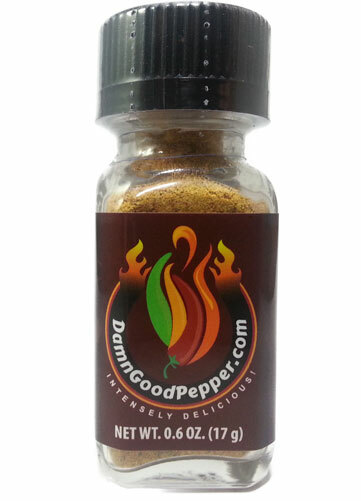 Damn Good Pepper 10.95 Available Now! For the people who can handle more heat and want even more complex, intense flavors, this is for you! The same delicious peppers that are found in the Original Blend are also found in the Special Blend but we have made several very important changes: we either further crushed or ground the peppers, enabling the faster release of the heat and flavors, increased the amount of the hottest peppers in the blend and we also added an even hotter pepper not found in the Original Blend. NOTE: Please start very slowly as it is hotter than the Original Blend. Share your bottle of pepper with your friends and introduce them to our amazing peppers and you can really help us out by getting the word out and letting the world know how much you enjoy our pepper blends. Take a listen to some of our commercials. We try to spread the love everywhere we can. Shows, podcasts, reviews, interviews, etc. where our peppers gets mentioned. If you need to reach us for any reason, please leave us a message. At Damn Good Pepper we take pride in making one thing extremely well - pepper blends. As pepper enthusiasts we take spicy food very seriously. Our products were born from the desire to increase spiciness and enhance the flavor of a dish without overpowering it. The creators of Damn Good Pepper traveled to many countries and sampled many different peppers. We found peppers that were extremely hot with an unpleasant taste and others that tasted delicious but did not pack much heat. By experimenting with different blends of the various peppers we managed to find the perfect ratio of spicy and delicious! Our pepper blends will add a kick and enhance the flavor of anything you put them on including soups, stews, curries, pizzas, sauces, desserts, alcoholic beverages, and much more. They consist of 100% crushed or ground dry peppers with no additives whatsoever so there are no ingredients (such as salt, vinegar, sugar, or chemicals) that can take over the taste of your food or drink. Don't like extremely spicy food? Damn Good Pepper is a spice that can be loved by all. Even if you are not into spicy food you can still enjoy our product. Just use a couple of flakes and you will enjoy the benefits of great tasting food without too much heat. Those who start with a small amount of pepper usually start to add more almost immediately. Just add a few flakes as desired, mix it in and enjoy. That's all it takes! Have any questions? Look here first. We try to answer any and all concerns you may have personally but here are the most common ones. What are they, hot sauces? No, they are not hot sauces. They are dry pepper blends consisting of 100% crushed or powdered peppers with no additives or fillers whatsoever. How are they different from hot sauces? Unlike most hot sauces that usually immediately take over the flavor of your food, where all you taste is the sourness, sweetness, bitterness, etc. of the hot sauce, our pepper blends enhance the flavor of most food and drinks. What's in your pepper blends? We start off with a few of the milder but tastiest peppers, such as the Thai and Japanese peppers, then add varying degrees of heat by adding several of the hottest peppers in the world, including the habanero pepper, the Bhut Jolokia aka ghost pepper, and the Trinidad scorpion pepper. We always aim for the perfect balance of flavor and heat. Help! It wont come out! Don't panic. That's by design. We made it so that the pepper doesn't simply pour out. If you want more, simply hold the bottle firmly with one hand, keeping it an inch or two away point the bottle's opening towards your food or beverage and very gently pat the bottom of the bottle until you get the desired amount. Why does it sometimes clump up, specially the Special Blend? It's because we don't use any anticaking additives, such as Silicon Dioxide. In our efforts to keep it 100% pure pepper, we have opted not to use any of the available anticaking agents. We have researched this and if there's enough demand for it, then we may consider releasing a version of each blend that contains a rice-based anticaking agent. The reason the Special Blend has more tendency to clump is because it contains a good amount of finely powdered peppers. If this happens then simply shake it well and it should unclump. Please use our contact form and we'll get back to you as soon as possible. Want to know more about peppers in general? Thanks to all the amazing people who helped to make this happen! DAMN GOOD PEPPER and INTENSELY DELICIOUS are Registered trademarks of Damn Good Pepper. All rights reserved. We only collect information that we need that is related to your order. This includes your: Billing address, Shipping address, Email address, and Credit card information. In addition we also collect information on your IP address, browser type, and Refer URL data. We use this data to prevent hacking attempts, help us know what web browsers people are using, and find out where our visitors are coming from so that we can improve our marketing. All orders are shipped within 48 hours Monday - Saturday 8am - 5pm. You should receive your package from 2-8 days after placing your order. 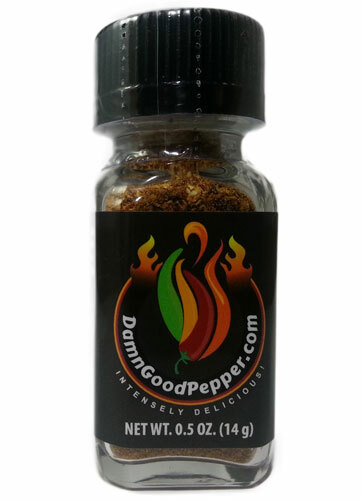 If for some reason you do not receive it within that time period, please let us know by emailing us at orders@damngoodpepper.com and please include your invoice number. We will always inform you if we run into unexpected delays. We use the following carriers to deliver our orders: USPS, UPS and FedEx. Not happy with our product? Please email us at returns@damngoodpepper.com and tell us how we can make it right, along with your invoice number. If we can't make it right, please send us back the remaining pepper and we'll be happy to refund the purchase price, minus shipping cost. Use the code for great discounts!